Legendary running back for the Dallas Cowboys Tony Dorsett will answer questions on his career path, growing up in the bad part of Pittsburg and the obstacles he overcame when he visits the Sam Houston State University campus on Nov. 16 as the guest lecturer for the 16th President’s Speaker Series. “A Chat with Tony Dorsett” will begin at 11 a.m. in the James and Nancy Gaertner Performing Arts Center Concert Hall. Dorsett took both college football and the National Football League by storm throughout his career. Considered one of the greatest running backs in college football history, the Aliquippa, Pa., native attended the University of Pittsburgh, where he crowned a brilliant collegiate career by being named All-American four times and winning the coveted Heisman Trophy in 1976. 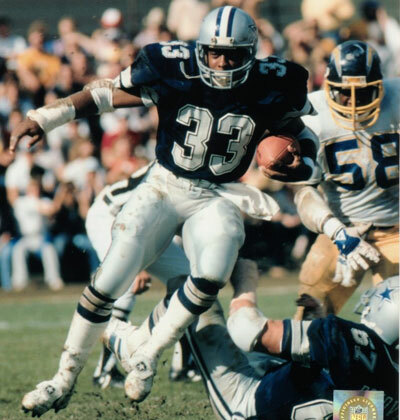 After being drafted by the Dallas Cowboys in the first round in 1977, Dorsett went on to win consensus rookie of the year honors in helping Dallas win Super Bowl XII. He is one of the top 10 all-time leading rushers in the NFL and the only NFL runner to gain 1,000 yards in each of his first five seasons. In 1982, Dorsett captured his first National Football Conference rushing title and established an unbreakable NFL record by racing 99 yards from scrimmage for a touchdown. A four-time Pro Bowl selection (in 1978 and 1981-1983), he served as team captain in 1981-1982 and 1984. In 1981 he earned consensus All-Pro honors and was named NFC Player of the Year by UPI. Dorsett also finished second to Roger Staubach in a 1979 Gallup Youth Survey of American teenagers' favorite sports personalities. In 1994, he was inducted into the prestigious Dallas Cowboys’ Ring of Honor, the College Football Hall of Fame and the Pro Football Hall of Fame. Today, Dorsett lives with wife, Janet, and their three daughters in the Dallas area. His son, Anthony, also a former NFL player, lives in the Dallas area as well. He works for Integrated Card Services, a credit card processing company. His newest venture is the promotion of IV-7, a revolutionary germ-fighting product. Dorsett is involved in many community activities and charities in Dallas, including Special Olympics and the Tony Evans Ministry. He also supports the McGuire Memorial Foundation in Pittsburgh, a facility for handicapped children. The Tony Dorsett Celebrity Golf Classic has raised more than $5 million over the last 17 years for the McGuire Memorial Foundation. The President's Speaker Series was created in 2002 by SHSU President Emeritus Jim Gaertner. Supported by a grant from long-time SHSU benefactor Lu Ellen Gibbs, the series is designed to introduce SHSU students, many of whom are first-generation college students, to people who are living successful and principled lives. Previous speakers have included Gene Stallings, Debbie Fields, David Robinson, Ken Jennings, J.C. Watts, Drayton McLane Jr., Sherron Watkins and Bob Dole, Marcus Luttrell and Lech Walesa. The event, which is free and open to the public, will end with a question and answer session from the audience.